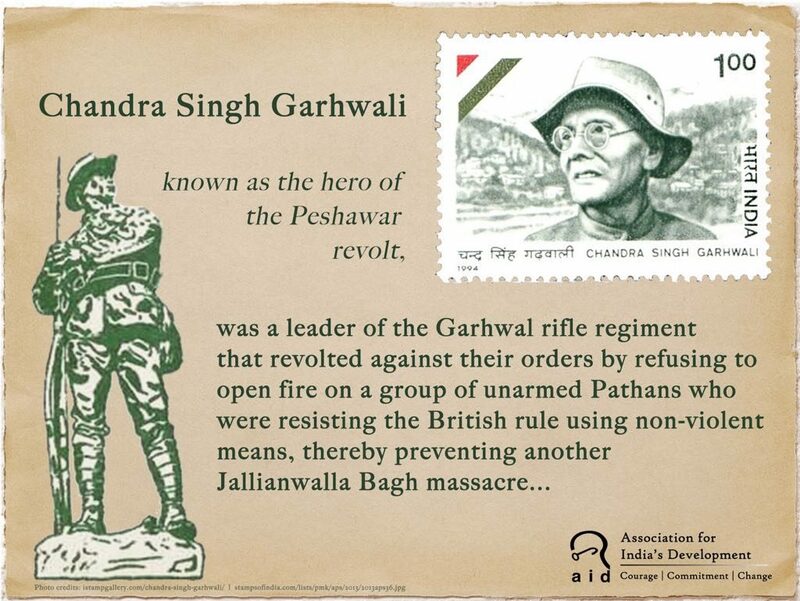 Chandra Singh Garhwali was a soldier in the British army and a hero of the Indian freedom struggle. His refusal to fire on unarmed, peaceful civilians averted a massacre and sparked off the Peshawar revolt of 1930. This important freedom fighter continued to work against caste and communal oppression after India’s independence. In spite of all his work and sacrifice for the people of this country, he died in poverty, with the bravery of his deeds unrecognized by the governments of India and Uttar Pradesh, and historians of independent India. 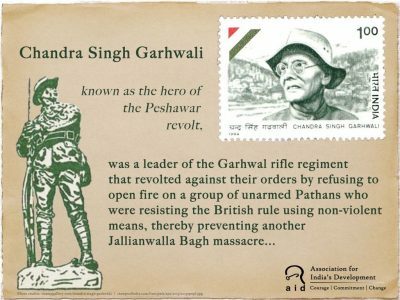 October 1 marks the death anniversary of Chandra Singh Garhwali, who is remembered as the hero of the Peshawar revolt. Sadly, however, outside of remembering him nominally, little is knowledge about his life is available through official archives, and he earned little by way of official recognition. This is unsurprising, as he was a lifelong opponent of power and authority. Chandra Singh was born in 1891 in the Garhwal region. Growing up, he had witnessed and experienced poverty and marginalization among the people who lived in the mountains. He joined the military at age 21, which was common among the youth of the mountain communities. He fought in the British army during the second World War. He was a member of the Arya Samaj and was deeply influenced by Gandhian thought, but his own thoughts and actions went far beyond these institutions. Although he was part of the military, he was a strong believer in democracy. He strongly supported and fought for communal harmony, and in an era of increasing communalization of the military, administration and media, his life and work is a important story that needs to be told. He was a leader of the Garhwal rifle regiment that revolted by refusing to open fire on a group of unarmed Pathans who were resisting the British rule using non-violent means, thereby preventing another massacre on the scale of Jallianwalla Bagh. Chandra Singh’s role in this significant revolt is largely forgotten by both historians and politicians, largely due to his revolutionary ideals. In this regard, we are indebted to the great historian Rahul Sankrityayan who in 1955 penned a biography of Chandra Singh Garhwali published by Kitabmahal Publishing House. I had heard of Garhwali’s legend as a child, as he belonged to a village neighboring the one where I grew up. But I realized his importance or greatness only when I read Sankrityayan’s biography. Sankrityayan’s work, which contains rare details of Garhwali’s life, is a significant contribution to Indian history and is especially important during a time when historical research has become a vehicle for propaganda. It isshameful that during their lifetime, eminent politicians like Govind Vallabh Pant did not honor a patriot like Chandra Singh Garhwali or acknowledge the sacrifices made by the latter as a freedom fighter. Rather, despite many years passing since Independence Chandra Singh Garhwali was treated as a criminal for his leadership of the revolt against the British. This was the period during which the leader of the Pathans in the Northwest Frontier Province (now part of Pakistan), Khan Abdul Gaffar Khan (also known as Badhshah Khan) was leading the non-violent resistance movement organized by Mahatma Gandhi. Under the leadership of Badshah Khan, the Pathans had extended their support to the Indian National Congress, and this act of solidarity was unacceptable to the British. To crush this resistance, the British selected a military regiment that did not belong to the area, hoping that the soldiers would follow orders of crushing the Pathan revolters without any compunctions. Even today, this is a common strategy deployed by the Indian government – hoping that a lack of linguistic or cultural commonality between soldiers and a local population will ensure that soldiers suppress dissent in a ruthless way. This was the hope when the British sent the Garhwal regiment to Peshawar and Abbotabad to crush the Pathan revolt. Peshawar was boiling. All the revolting soldiers escaped harm and returned from the town center to their barracks, where they were arrested. Chandra Singh was sent to the jail in Abbotabad, where he was imprisoned for nearly 14 years. The notable aspect of this revolt was that it stemmed from patriotism and a feeling of solidarity between the soldiers and the local population. Peshawar was a foreign place for Chandra Singh and his colleagues. They did not even have a place to escape, as the Northwest frontier was an alien land where neither the language nor the food was familiar. Most of the soldiers were Hindu, and not educated beyond middle school. Despite these differences, they set an example of solidarity and patriotism that transcended the boundaries of religion. Most of these soldiers came from the eastern Himalayan mountains where there were very few Muslims, yet they took a principled stand of refusing to bring harm to their fellow people, and where they had no surety that anyone would advocate in support of their revolt. This act of bravery represents a shining example in the legacy of India’s freedom movement, and yet this has been reduced to the margins by historians. Is it then surprising that a person with revolutionary thoughts like this would be immediately eschewed by Savarna politicians like Govind Ballabh Pant and others? Chandra Singh Garhwali remained in poverty through his life. He lived with the pain that the heroes of the Peshawar revolt were never appropriately honored by the governments of either Uttar Pradesh or India. It’s a matter of great shame that the government valued Garhwali’s contributions to the freedom struggle at no more than 14 rupees a month. This is but one example of how many freedom fighters were treated post independence. On October 1, 1971 Chandra Singh Garhwali passed away in penury. It is a sad irony that in this age of glitter and showmanship, Garhwali’s life and contributions are referenced by casteist politicians and campaigners in their speeches, without any understanding of the ideals and values he stood for. But we call on the people of India to remember justly this hero of the Peshawar revolt and a lifelong champion of communal harmony and solidarity. Vidya Bhushan Rawat is a social activist and writer who has been working directly with the marginalized communities in India for the last 25 years.